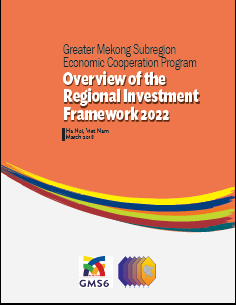 The Regional Investment Framework 2022 is the medium-term pipeline of priority projects in the Greater Mekong Subregion (GMS). It is a consolidation and expansion of the earlier Regional Investment Framework 2013-2022 and the Revised Regional Investment Framework Implementation Plan 2014-2020. It continues to operationalize the strategic thrusts and priorities of the GMS Program under the GMS Strategic Framework 2012-2022 and the Hanoi Action Plan 2018-2022, which reviewed and refined these strategies. The medium-term pipeline comprises 227 investment and technical assistance projects, requiring $66 billion in estimated financing. The GMS Regional Investment Framework 2022 was endorsed at the 22nd Ministerial Conference in Ha Noi, Viet Nam on 20 September 2017. It was adopted during the 6th GMS Summit of Leaders on 31 March 2018 in Ha Noi. The GMS leaders directed officials of the GMS Program to ensure that the Regional Investment Framework is monitored and updated regularly.